Using the DEFCON defense system to analyze financial risk (with 5 the lowest and 1 the highest); we are currently at 4. Banks are underperforming in several areas: slow loan growth (only .8%) and increase in deliquencies, specifically auto loans and credit card. Interest rate volatility has increased more over the past 18 months than in the previous two years. Rate increases could negatively affect credit affordability, performance, and asset valuations and influence refinancing risk, underwriting behavior and credit terms. We've seen dramatic regulatory change recently. New rules should let banks adjust their risk-taking appetite; impact of regulatory change will likely be as substantial as it is unpredictable. Likely to slip to DEFCON 3 over the near term. The movie WarGames helped introduce the DEFCON system to the public back in 1983 (including a 14-year-old future bank strategist who took his first date to the movie, perhaps explaining why it remains memorable). DEFCON—or defense readiness condition—reflects U.S. military preparedness for war on a rising scale of severity. DEFCON 1 indicates the highest military alert status, as in a state of war. DEFCON 5, meanwhile, signals the lowest threat level, or the degree of readiness during peacetime. For perspective, the DEFCON level reached 2 during the Cuban Missile Crisis in 1962. Today, it sits at 5. Over time, DEFCON has seeped into the public lexicon where it’s been used to talk about threats that have nothing to do with defense. We thought about it within the current landscape of financial risk, where there are troubling medium- and longer-term trends, including fundamental changes to regulatory regimes. Now to be clear, this is not a dire announcement, but the current level also doesn’t indicate “a world at peace.” We have moved to DEFCON 4 from 5. Let’s review. Start with bank performance. We’re almost halfway through 2018 and banks have underperformed in several areas. Bank stocks have traded sideways. What’s more, many had expected loan growth to drive better performance. But for domestic banks, loan balances have risen just $67 billion this year from a starting balance of $8.5 trillion, according to the Federal Reserve’s H.8 report. This equates to 0.80 percent growth, weak by almost anyone’s definition. Slowing loan growth may concern bank shareholders, but should it raise alarms from a risk perspective? Well, maybe, when we examine why it’s happening and what it could trigger. Digging into 2018 data shows that consumer loans have fallen by $18 billion, representing a 1.3 percent hit to domestic bank balance sheets. Those numbers have declined as senior loan officers continue to tighten consumer lending standards. Commercial and industrial loans, meanwhile, have picked up the slack, increasing by $56 billion over the same span (marginal sectors make up the balance). This constitutes a problem for investors. Consumer and credit-card loans generate 9.11 percent yields, while commercial and industrial loans yield just 4.36 percent. Collectively, all bank loans generate 4.98 percent yields, according to SNL Financial, a number that will decline as more industrial loans replace consumer loans. And as consumer, auto and credit-card loan terms remain tight, margin compression—which many managers told investors would fade this year—will persist. To mollify investors, it’s easy to imagine loan officers loosening lending standards on consumer loans to offset this compression. 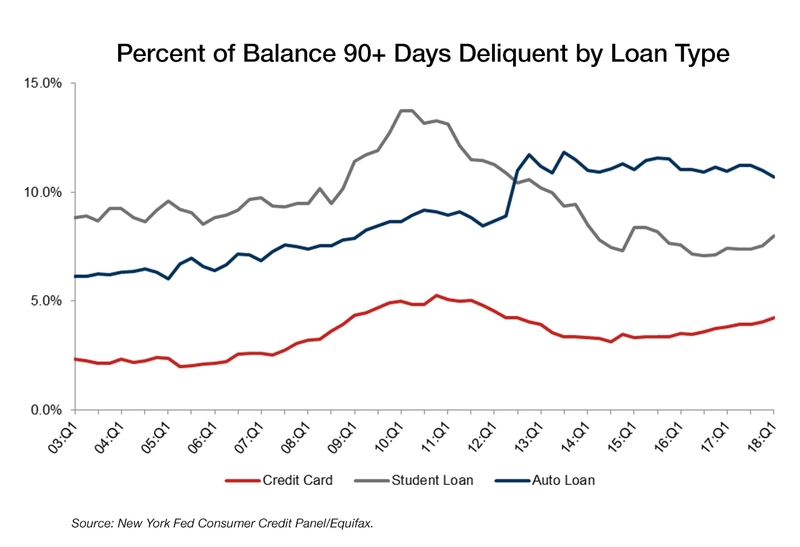 Consequently, we’ve begun to see an uptick in delinquencies (see credit card and auto loans, in particular). 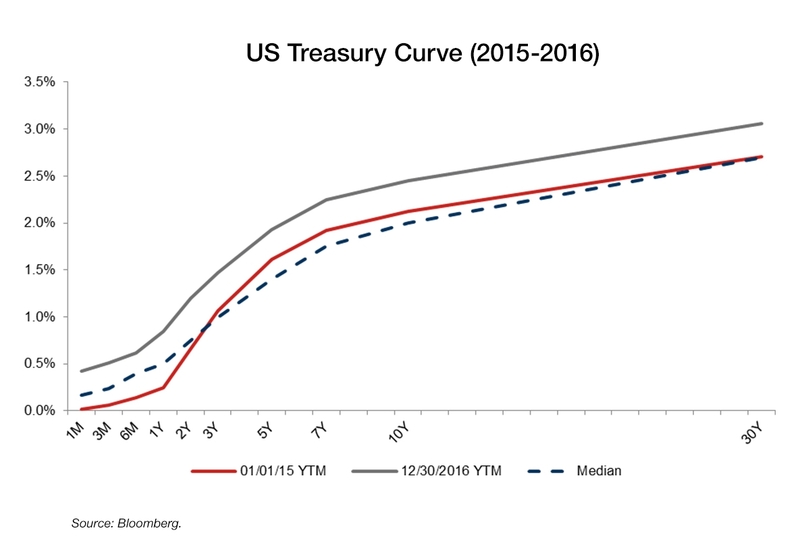 The next piece of our DEFCON shift involves interest-rate volatility. The specter of interest rate risk and convexity risk continues to be of significant concern for banks that have become very used to low deposit betas and accommodative Fed policy. The OCC’s Semiannual Risk Perspective identifies among its key risks that multiple “rate increases could negatively affect credit affordability, performance, and asset valuations and influence refinancing risk, underwriting behavior, and credit terms.” This sentiment will sound familiar to those who have followed our most recent public missives on the subject, including on an article we wrote in May 2018. Rate levels aren’t necessarily the biggest concern. But the possibility that we’ll sit closer to 2.75 percent on the 2-year if the 10-year hovers closer to 3 percent augurs poorly for many fixed-income managers, including bank managers. Interest-rate volatility has increased more over the past 18 months than in the prior two years. That dynamic seems unlikely to revert, particularly if global pressures continue. Heightened volatility alone may not spook markets, but the risk of unmet expectations and unexpected consequences may. 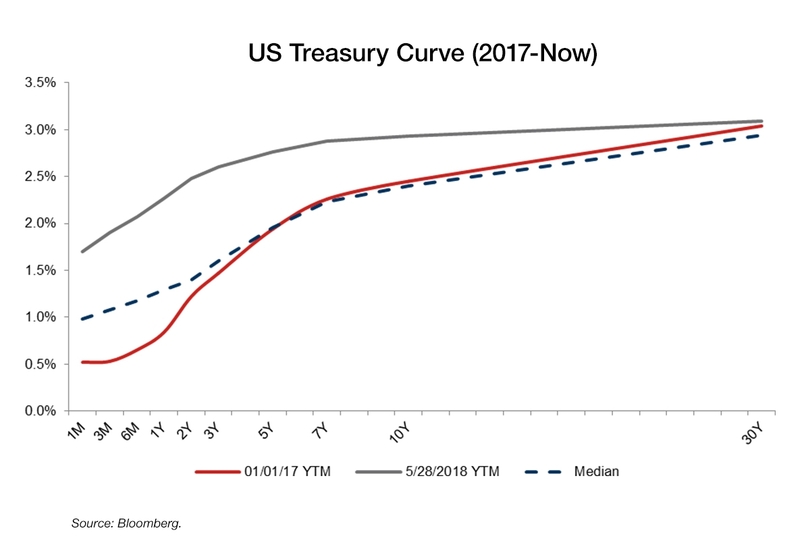 Bank analysts debate daily the rate at which funding costs increase versus the absolute level of short-term rates change (or long-term rates). But this is simple. Bank funding (including deposits, borrowings and debt) in 2017 increased almost five times as much as it did over the previous two years thanks to a flatter curve and a more rapidly rising absolute level of rates. It’s worth noting that if institutions that consider themselves “asset sensitive” aren’t vastly outperforming, perhaps we should reevaluate the premise of asset sensitivity. The underlying hope that deposit rates would remain tethered while asset yields rose has not come to fruition. And it doesn’t seem likely to in the near term, given the paucity of lending growth in lower credit opportunities. There may be plenty of capital to protect against legacy loan books, but boards, regulators and management teams show no interest in increasing allocations to weaker credits. This brings us next to the regulatory changes that we expected to be front and center from the first minute we saw the Treasury report last June. In the past 100 days, we’ve seen some fairly dramatic regulatory change, highlighted by Idaho Sen. Mike Crapo’s bank-reform bill. While we didn’t expect the bill to pass exactly as written, as expressed in an earlier post, we stand by the conclusions we reached: the new rules should let banks adjust their risk-taking appetite, which will likely spark changes in the space, particularly related to SIFI thresholds and leverage ratios. Other regulatory proposals address stress buffer requirements, leverage ratios, auto lending guidance, CECL, reforming CRA and Orderly Liquidation Authority. All told, the full impact of regulatory change will likely be as substantial as it is unpredictable. This combination of dynamics—weak lending growth; more delinquencies on existing loans; a challenging curve environment; the potential credit impact of rising rates; disappointing 2018 returns and a daunting regulatory wave—moves us to conclude that risks are rising. We’re now at DEFCON 4, and appear likely to slip to DEFCON 3 over the near term. In a world not at peace, a very cautious and planned approach is the way to go.